The first weekend of February I traveled to Otepää in Estonia to participate in VastlaCamp, a Hospitality Club and CouchSurfing meeting. With a few friends I ended up joining the Georgian team in Winter Olympics which were not even part of the camp. :) See the photo gallery. Vastlapäev is the Estonian name for Shrove Tuesday, or laskiainen in Finnish. Traditions of the festival include building sledges and sliding downhill in them. Some might aim for a long slide, but at least among students nowadays it's more about style: the funnier the better. That was also the plan at VastlaCamp, but because of small amount of snow and lack of equipment the sledge building part of the camp on Saturday was cancelled. I went for a walk with a few other people and noticed a group of people marching in a formation and shouting something. They were carrying signs reading "Armeenia", "Georgia", "Kreeka" and "Nigeeria". It looked fun so we immediately joined the procession and the Georgian team got surprise reinforcements. Olympic rings were formed and flag hoisted, and the first event was a skiing competition. 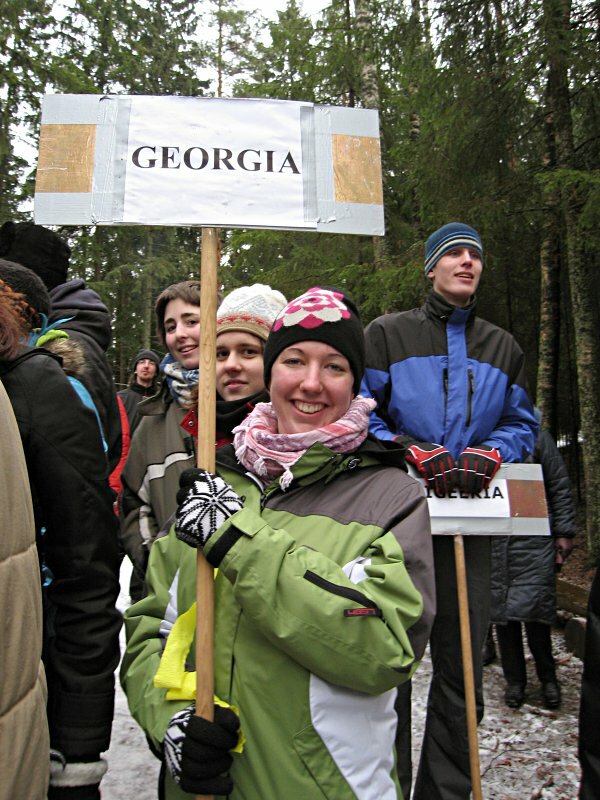 Later it turned out that the "olympics" were part of a teambuilding event for the Delfi company which maintains a popular news website in Estonia, Latvia and Lithuania. First they actually thought we were some Latvian employees who were expected to arrive late. The reality was soon revealed but it didn't matter, they kindly welcomed us. So we got a chance to try sledging after all, both downhill and on flatland. After a couple of hours we headed back to the camp which was at the Otepää high school. Pea soup and special buns were waiting for us and before evening sauna we still had time to go snowtubing. There were also a lot of social games both Friday and Saturday evening. One of the most interesting ones went like this: Chairs were put in a circle and participants sat on them sideways, knees as close to the chair in front as possible. Next everybody leaned back on the lap of the person behind. Then the chairs were taken away one by one... against all odds it actually worked and didn't result in everybody collapsing down! Other games included air guitar competition, button spinning, and writing a folk song in 5 minutes. Saturday night ended in a costume party and dancing. My favourite costume was a cardboard television set which had enough space for another person to join in order to create a tv program. I dressed up as a Japanese in festival outfit which matched my habit of going around and taking photos of all the others. One of the classrooms of the school was reserved for the party and next three for sleeping, the closest to the party room being labeled for "party animals" and the furthest for "sleepers". The party animals room wasn't quiet but not too wild either. A few people who didn't want to dance all night gathered there in a story telling circle. Vivid descriptions of bus travel with chickens in Bolivia and hitchhiking experiences all over Europe were just some of the topics. The total number of participants was about 40 which felt just right for that kind of meeting. About half were from from Estonia and other half from neighbouring countries. Estonians have been very active in Hospitality Club and the HC Eesti spirit was certainly there! It was my first HC/CS meeting in Estonia but probably not the last. I'm in Tartu now, and being kindly hosted by Lauri Anton from EENet means that finding an Internet connection is not a problem. :) Actually it should be pretty easy in Estonia in general, there are plenty of wireless access points, libraries and some Internet cafes have computers and the places to get connected are conveniently marked on maps. The oddest sight during the ride from Tallinn was a truck pouring small grained light brown sand on a lenghty section of a normal paved road. The result was naturally a big cloud of dust every time a car drove by. They weren't just as big as the dust clouds on the dry unpaved roads, but almost! Other than the dust I had a very nice ride to Tartu, sunshine all the way and not too much traffic. My friends asked if I had noticed how Estonian motorists drive dangerously and ignore cyclists - no, didn't have any problems. It would have been even nicer in three or four days with more detours, this time I squeezed it in two days. Tomorrow I have time for sightseeing in Tartu, today's short sigthseeing time was spent on a special tour in the EENet office with Lauri and Mihkel. It included the usual visit to the server room, but also an evaluation of the roof terrace with appropriate beverages. Later in the evening I also met Lauri's wife and daughter, and had a dinner and a sauna in their nice new house.